Where the seaweed came from? Getting the answers to these questions will help scientists better manage this species and other invasive and non-native species. Click the link below to learn more about Sarah's work with the Invasive History Project! What else has Sarah been up to in the lab? 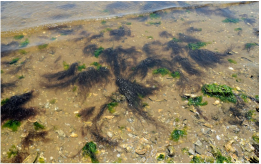 Sarah has been researching how exposing Gracilaria to different temperatures can affect its health. Check out her experiment below!